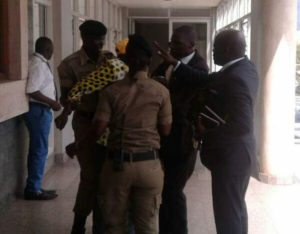 Police officers and Hon Abala rescue MP Abiriga from further punishment. Courtesy photo. KAMPALA–There was drama at Parliament on Tuesday afternoon after two legislators from Arua district exchanged blows. The fight stemmed from accusations by Arua Municipality MP, Ibrahim Abiriga, that Ayivu MP, Bernard Atiku, was peddling lies against him. Abiriga, who was chatting with journalists at the South wing of Parliament, reportedly revealed that during a recent match of Onduparaka Football Club and accused Abiriga of fronting for the removal of presidential age limits. Atiku reportedly stated that Abiriga and State minister of Investment, Evelyn Anite were Congolese and not Ugandans. While Atiku ignored the statement, Abiriga further accused the MP of being stupid and a fool, a remark that stirred a knee jerk reaction. Atiku charged at Abiriga, who was dressed in a yellow, white and grey African print shirt with a yellow T-shirt inside, and punched him in the face. Abiriga tried to retaliate but missed. At that point, a number of MPs who had walked out of the plenary sittings in the chambers rushed to the scene to separate the duo. Among them were Ngora County MP, David Abala and Bukooli Islands MP George Abbot Ouma, plus a couple of police officers who blocked the MPs from continuing with the fight. Once separated, Atiku marched off to the main parking lot where he got into his car and drove off. While speaking to journalists, Abiriga claimed what Atiku had done to him was not a fight, warning that he would wait for him for a bigger fight. He asked for several bottles of water to cool down, after which he also got into his car and drove away..